We have had so much going on around here lately, it is almost ridiculous. I have been trying to post about a week now (and trying to call you Aimee! !--I swear I will!) Posting just keeps getting put off for more important things! (That sounds SOOOOO familiar....have I actually said that exact thing before? It wouldn't surprise me.) But today, I am taking the time to do this! 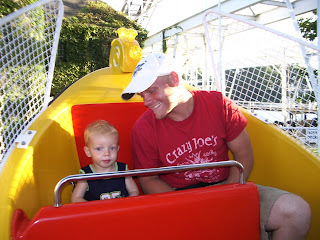 We took a vacation day and went to Indiana Beach a couple of weeks ago (the day after Colin's wedding). We had a wonderful time. Here are a few shots of our adventure! 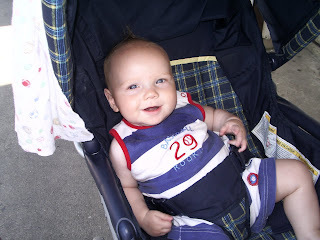 Ethan was an absolute GEM all day, sitting for the most part, very contentedly, in his section of the stroller. He is such a great baby! 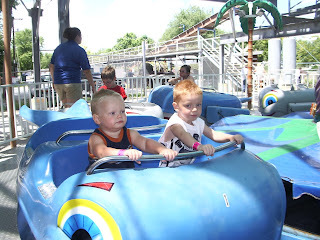 Colin rode his very first ever "big boy ride" with Mommy and Daddy--you know the one that just basically goes around and around so fast you think you are going to fall out the side of the ride, then it slows down, stops, and then goes backwards just as fast? That was the one he rode! He did great and said he loved it! Here is a self-picture of that one. 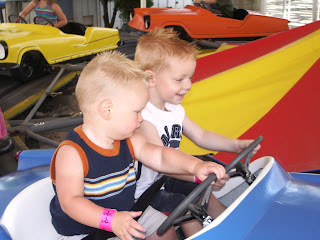 Colin and Cameron loved riding the smaller rides together too--Cameron did so much better than Colin did when he was this age! 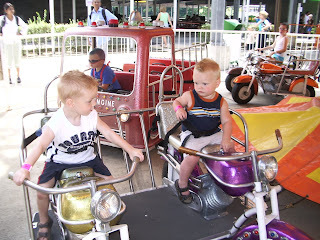 We knew that was because he had his big brother by his side the whole time, and when you are riding with someone it makes it so much more fun! 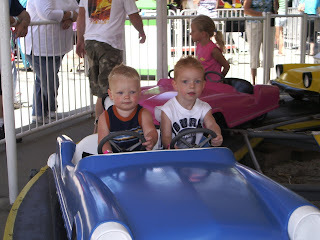 Here is a shot of Colin (riding with Daddy) when he was Cameron's age! And a couple below of Cameron and Colin together this year. We all had a ton of fun! My mom went with us and was such a HUGE help. She always is! 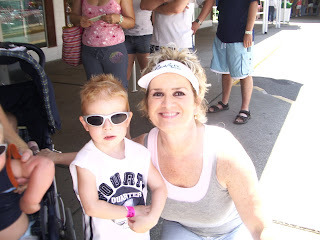 You know, I don't really say too much on this blog about my mother, but she is such a huge part of the boys' and our family's lives. She comes to our house EVERY Friday night (without fail!) and watches the boys, so that Shane and I can have a date night together. 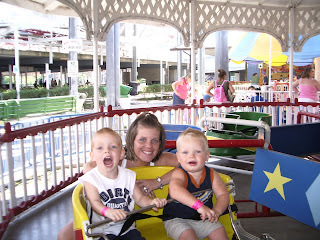 It is such a special time for Shane and I, and for the boys also....they really look forward to it! (Not as much as Shane and I do, though! :-) Hee hee.) 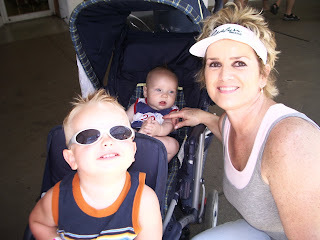 I wanted to post a couple of shots of the boys with grandma--or "baba" if you are Cameron. We are so glad that she was able to be a part of our vacation day! Thanks Mom, for everything you do for us--We love you! 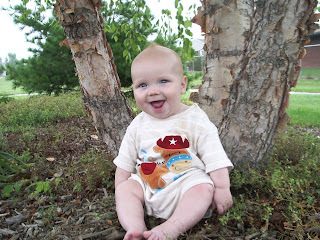 We had a great time this past Saturday doing some family things....we got Ethan's six month pictures taken (finally!! ), went to see the "duckies" at Sunset Park, and then went to a playground so the boys could play for a while. The park is right near a driving range, so Shane took them hunting for stray golf balls (they found seven!) 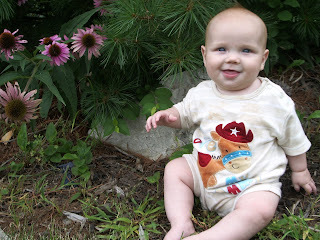 while I took some outside pictures of my sweet little Ethan. 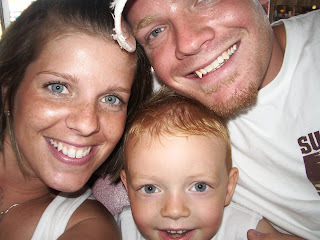 Here are two of my favorites, and the rest of his (plus more of all the boys) are on the slide show. 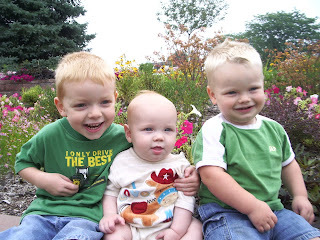 Also, a great shot of all three boys together at Sunset Park. We had a great day together, and every day that passes I am more and more grateful for the children and hubby that God has given me. I am so blessed! Your three are total dolls! You just want to kiss that baby's cheeks! :) That is so great that your mom gives you a date night! My parents take the boys every Sunday for lunch so Gary and I can go somewhere nice and sit down. Then we go back and get them to bring them home for their naps. It is great!